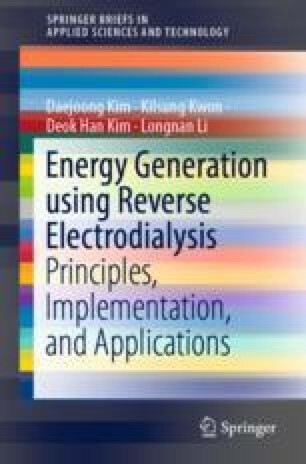 This book comprises six main parts: evaluation of basic parameters (e.g., inlet flow rate and compartment thickness), effect on a spacer open ratio, comparison of a power generation with combinations of various resources, brine recovery in membrane-based desalination processes, a study on predesalination and chemical energy recover in reverse osmosis (RO), and investigation of ammonium bicarbonate solutions. This chapter first introduces salinity gradient energy (SGE), followed by the basics of reverse electrodialysis (RED). Also, the scope for this book is included.